With technology becoming more and more sophisticated, it is very good to consider the new ways to market your business and improve your online visibility. Google has introduced Google 360° Virtual Tour, which enables businesses to showcase the interior of their offices and/or stores through an interactive virtual online tour. Discover how this new feature can help enhance your business by building a stronger online presence. Also enjoy an exclusive $100 OFF discount from Websites Depot. A new approach to online presence. The Google 360° Virtual Tour is a new Google feature that lets you showcase the inside of your business. This allows online visitors to get a feel of your entity before they step into your door. The Google 360° Virtual Tour is essentially very similar to the Google Street View, the difference however is that the Google 360° Virtual Tour features the interior of your business — familiarizing people with your business before they even visit you physically. From their screens to your doorsteps. 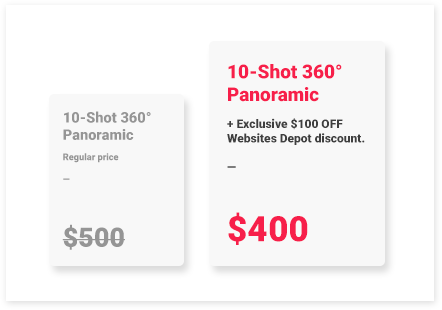 A professional photographer from Google will arrive at your business and take panoramic shots of your office or store. Soon people will have the option to tour your business online and thus encouraging them to visit you. Click here to experience the Google 360° Virtual Tour. Also remember to refer back to this Newsletter to redeem your exclusive discount. 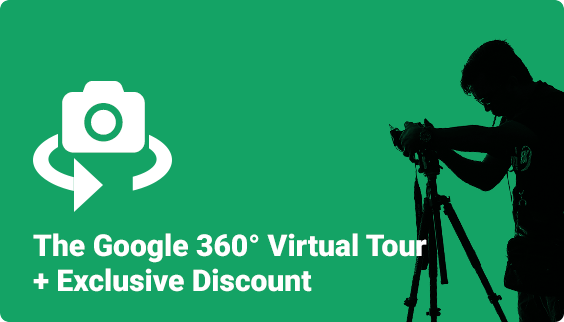 As a certified Google Partner, we are happy to offer a generous $100 OFF your Google 360° Virtual Tour for your business. This offer may have expired. Please check if still active.